This tour includes, walking tour in Sofia plus visit of Boyana Church – a monument of the UNESCO World Heritage List , visit of Rila Monastery – UNESCO monument, visit of Melnik, half day tour of Thessaloniki ( Greece ) with it Paleochristian and Byzantine monuments inscribed on the World Heritage List of UNESCO , visit of Meteora - on the World heritage list of UNESCO ( tour of 2 monasteries ), visit of Ohrid ( on the World Heritage List of UNESCO ) -visit of St Naum monastery, visit of Skopje, visit of Pristina. Day 1 – Sofia – Arrival. Transfer airport- hotel . Visit of Boyana Church – a medieval treasure listed on the UNESCO World Heritage List. A guided walk tour of the city center in English to get acquainted with its long and turbulent history (approx. 3 hours). You will see St.Sophia church dating back to 5th-6th century of our era, a monument of Bulgarian medieval civilization that gave the current name of the town. Visit the largest cathedral Alexander Nevski with its gilded dome, the rotunda St.George 3th-4th century and the city fortress and you will feel the atmosphere of the city, which history dates over 5000 years ago. Dinner in a typical Bulgarian restaurant to enjoy Bulgarian cuisine and folk music (optional – 22 euro/pp for 3 course menu , including beverages). Overnight in 4* Hotel BB in Sofia. Breakfast. Departure to Rila Monastery. Rila Monastery is one of the most impressive UNESCO world heritage sites in Bulgaria and it is the largest Eastern orthodox monastery in Bulgaria. 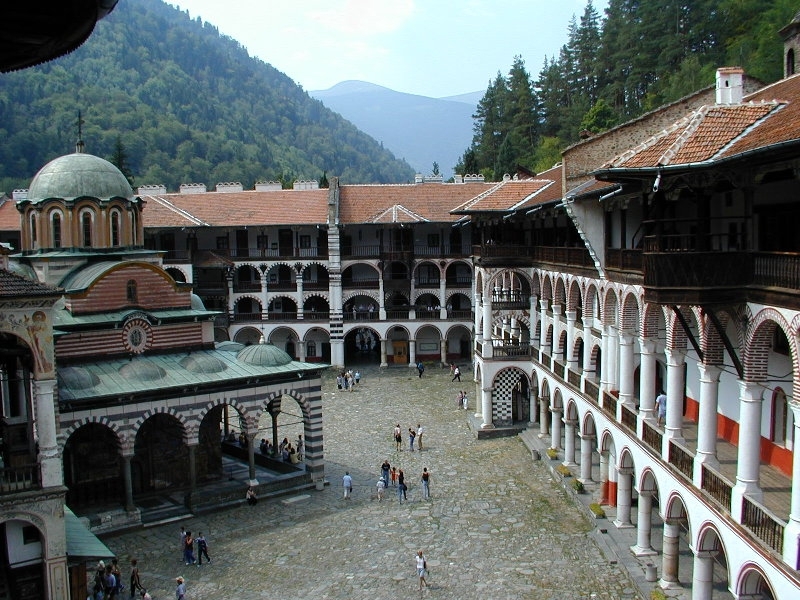 Founded in the 10th century, the Rila Monastery is regarded as one of Bulgaria's most important cultural, historical and architectural monuments and is a key tourist attraction for both Bulgaria and Southern Europe. The whole complex occupies an area of 8,800 m² and is rectangular in form, centered around the inner yard, where the tower and the main church are situated. Departure to Melnik - the smallest town in Bulgaria (208 residents). Melnik, is nested in the south slopes of Pirin, among sand pyramids with queer forms. Melnik is famous with its beautiful rich houses from 17-18 centuries , its strong red wine and the beauty of the sands pyramids. Overnight in 4* hotel in Petrich – the town of the famous prophet Vanga. Vanga lived in a small house in the Rupite, near Petrich, because according to her relatives she considered the area an energy source and collected her powers from it. There is a church built by monetary means, provided by Vanga, and it is interesting because of its wall paintings. They were made by the famous Bulgarian artist Svetlin Rusev and they are quite realistic, which differentiates them from the Orthodox canon. Despite the fact that the temple was not built according to the rules of the Orthodox church, it attracts thousands of worshippers and tourists because of its connection with Grandmother Vanga. Breakfast. Crossing the border between Bulgaria and Greece and in an hour arrival in Thessaloniki. City tour passing through the main sites of interest – the Paleochristian and the Byzantine Monuments inscribed on the World Heritage List of UNESCO : the picturesque old town, the Byzantine church of Agios Dimitrios, the Arch of Galerio, the Rotonda and the lively city center. Time for explore the city .Overnight in Thessaloniki in 4* hotel. Breakfast. Departure to the site of Aigai ( modern name Veria ) on the list of UNESCO of World Heritage.Visit of the impressing museum containing the Royal Macedonian Tombs and other treasure of spectacular beauty.Vergina became internationally famous in 1977, when the Greek archaeologist Manolis Andronikos unearthed the burial site of the kings of Macedon, including the tomb of Philip II, the father of Alexander the VGreat. On the lid of the Iarnax of Philip II there is a symbol of a sun or star and this Vergina Sun has been adopted as a symbol of Greek Macedonia. Visit of the archeological site. Departure to Meteora .Visit of the impressive “Meteora” and the Byzantine monastries “hanging” on the top. The monasteries are on the top of the rock towers. The Meteora is included on the UNESCO World Heritage List. It’s one of the largest and most important complexes of Eastern Orthodox monasteries in Greece. Visit of 2 monasteries . Overnight in Kalampaka in 3* hotel in Kalampaka. Breakfast. Departure to Ohrid. Visit of Ohrid. Tour will start with visit of the St Sofia church. The treasure of medieval architecture and painting. Frescoes which are best preserved examples of Byzantine monumental activities which took place in the period between 10th and 13th century. Center of the Ohrid Archbishopric, whose boundaries stretched from Danube to Albania and Today this building is a place for conducting various cultural chamber concerts, recitals and poetry readings.Later you will visit Ancient Theatre, St Virgin Mary Perivleptos church, Ohrid`s Icon of Gallery , Tsar Samuil fortress, Plaosnik and St Jovan Kaneo church ;built on one of the most beautiful places on the shore of Lake Ohrid inscribed on the World Heritage List of UNESCO including the cultural and historical area. Overnight in 4* hotel BB in Ohrid. Breakfast. Visit of the Resting place of St.Naum, one of the best pupils of St. Cyril and Methodius. It is believed that his relics have healing powers. Magnificent church made of stone and brick. The church was originally built with the foundation of the monastery in the 9th century, but has been restored in the 16th century.Wonderful landscaped complex that is a home to colorful birds of paradise. Located near the clear lake, close to the spring of river Crn Drim, which is covered by willows and accompanied by rare freshwater turtles. Deaprture to Skopje. Visit of the “Old Town”. Further visit of Stone Bridge, Memorial House of Mother Theresa, City square and many monuments from the project Skopje 2014 as well as Macedonian Parliament. Tour will end with sightseeing of Skopje fortress.Overnight in 4 * hotel in Skopje. Breakfast. Departure to the capital of Kosovo. Visit and sightseeing of Pristina. Back to Skopje. Overnight in 4 * hotel in Skopje. Breakfast. Departure to Sofia. On the way Kumanovo visit of the Megalythic observatory of KOKINO -the fourth oldest observatory in the world. Arrival in Sofia. Free time for leisure and visit the city. Overnight in 4 * hotel . Breakfast. Timeime for leisure and shopping. Optinal one day excursion to Plovdiv ( 28 euro /pp min 4 pax ). Plovdiv is the oldest living city in Europe with 8 000 years of history. It was founded before Athens, Rome and Constantinople in the time at which was based and the ancient city of Troy. There are artifacts of Thracian civilization. The Thracians were famous in the ancient world for its wines, which were declared as the best. The period during which Plovdiv has been within the Roman Empire was marked by the construction of many large public buildings like an amphitheater (late first and early second century of our era). And nowadays it is used for performances and outdoor concerts. Other major monuments of Roman civilization are the Roman Forum (2nd century BC) and Roman stadium in length of 180 meters and with 30,000 seats (second century of our era). At that time the name of the city was Trimontium, which means "town on three hills." Bulgarian history is presented in the old town of Plovdiv with the big beautiful houses of 18 -19 centuries. They are evidence of the economic power of the city during this era. At that time Plovdiv compete with Thessaloniki and Istanbul. The walk along the narrow cobbled streets between high walls and overhanging second floors take us back in time. Return to Sofia. Overnight in 4* hotel in Sofia.